"The iconic green bean casserole is reworked with the flavors of French onion soup -- caramelized onions and Gruyere cheese." Preheat oven to 375 degrees F (190 degrees C). Grease a 9x13 inch casserole dish. Heat 2 tablespoons of butter in a large skillet over medium heat. Stir the onions into the pan; cook and stir until very soft and golden brown, about 15 minutes. Stir in sherry vinegar. Transfer to a small bowl, and reserve. In the same skillet, melt 2 more tablespoons butter. Whisk in 2 tablespoons flour. Stirring constantly, cook over medium heat until the flour smells like baked pie crust, about 3 minutes. Slowly whisk in milk, about 1/2 cup at a time, then whisk in nutmeg, cayenne pepper, and thyme. Bring to simmer, and cook until thickened, whisking constantly, 3 more minutes. Transfer to a bowl and reserve. Melt remaining 2 tablespoons butter in clean skillet; stir in panko until all crumbs are coated; reserve. Bring a large saucepan of salted water to a boil over medium heat, and boil beans until bright green and crisp but not raw tasting, 3 to 4 minutes. Drain very well. Spoon half of the caramelized onions into the prepared casserole dish; top with green beans. Season with salt and black pepper. Spread reserved white sauce over the green beans; sprinkle with half of the Gruyere cheese. Top with the rest of the onions, and use the back of a spoon to push onions down into sauce and cheese. Top with the buttered panko crumbs, the remaining Gruyere, and Parmesan cheese. Bake in the preheated oven until hot throughout and lightly browned, about 30 minutes. Let sit 10 minutes before serving. 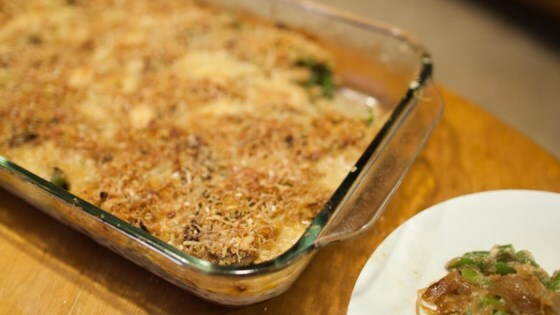 See how to make classic French onion and green bean casserole.